Why You Should Check It Out: There’s something for everyone at Sweat Pilates…everyone who wants to sweat, that is! For those seeking a core toning, muscle chiseling workout, the signature Sweat Pilates class turns up the intensity on Proformers. For anyone nostalgic for the days of a backyard trampoline, SP Bounce uses mini trampoline “bouncers” to add a low-impact cardio blast to the Proformer Pilates workout. A TRX bootcamp is available for anyone ready to shred, and a variety of cardio-heavy classes promote healthy heartbeats and bodies. In all of the classes, the energy soars and the time flies. Even through the toughest moments, a supportive community of classmates and instructors sweat alongside one another, and provide extra encouragement. What Makes It Such An Effective Workout? Combining low-impact cardio with muscle toning resistance training enables Sweat Pilates classes to be a regular - if not daily - activity. “You don’t have that impact on your joints, so you can focus on toning your muscles up, the resistance training and the cardio part of it without having to be so concerned with what’s happening with your joints,” says Sweat Pilates co-owner Kenna Ramsey. The classes are so joint-friendly that Sweat Pilates is even encouraging students to take on 100 Days of Sweat, in which they move for at least 20 minutes every day for 100 days, both in and outside of their Sweat Pilates regimen. Don’t Forget About Recovery: Sometimes it’s best to resist the urge for an intense workout every day. 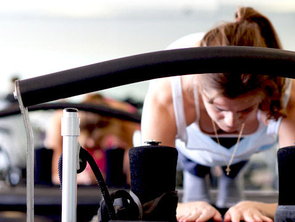 Sweat Pilates has Core Stretch classes to incorporate as part of an active recovery. Know Before You Go: Limited parking is available in a lot behind the studio, with additional parking on Washington Boulevard and the surrounding neighborhood streets. Take care to observe street signs when parking. Bring Toesox or go barefoot in any classes that use Proformers: no socks or shoes are allowed on these machines. Come Prepared With: Wear workout clothes that allow you to stretch, bounce and sweat! Beyond attire, bring a water bottle and a towel to combat the inevitable sweat. Changing rooms are available onsite; locker rooms and shower facilities are not. At Sweat Pilates we are committed to just that...making you SWEAT! We provide a fun, energetic, and positive environment where you can work hard to become your best self. Forget long mindless gym workouts, at Sweat we have classes that will have you drenched in less then an hour. 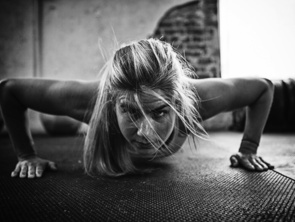 Whether your a boxer, bouncer, stretcher or Pilates Beast - Sweat has you covered. Come get inspired and be an inspiration! Sweat Pilates is owned and operated by real people who love fitness. We're not your typical gym--and we're proud of it.